Step 1 Peel the potatoes and cut into chunks. Place in a large pot and add cold water to cover. Add about 1 teaspoon salt. Cover and bring to a boil over high heat. Uncover, reduce the heat slightly and cook at a steady boil until a test chunk can be easily mashed with a fork, about 10 to 15 minutes. Step 2 While the potatoes cook, combine the milk and cream in a small saucepan and bring just to a simmer. Set aside in a warm spot. Step 3Drain the potatoes well in a colander. Return to the pot and add the butter. Mash until fairly smooth. Gradually mash in the milk-cream mixture. Season with additional salt as needed and white pepper to taste. In Recipes-list.com we have selected the most viewed recipes from category - Sides Vegetarian . Enjoy the best recipes specially selected for you! 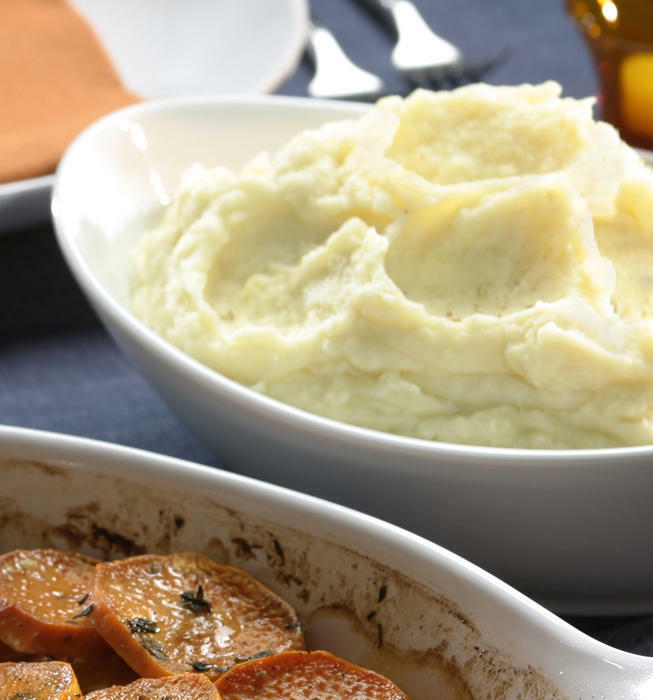 Creamy mashed potatoes is the right choice that will satisfy all your claims.